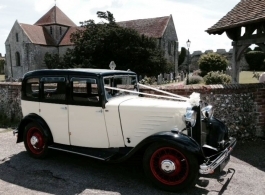 Vintage 1930's wedding car for hire in Southsea, Portsmouth, Southampton and surrounding areas. This very rare vintage wedding car is a 1933 Singer 14hp Saloon in Cream and Black. You can be Chauffeur driven to and from your wedding venue in this unique, British built car which is an absolute must for your treasured wedding day photos.